This volume focuses on multilateralism in the 21st century and examines how, and how effectively, the EU delivers on its commitment to effective multilateralism. 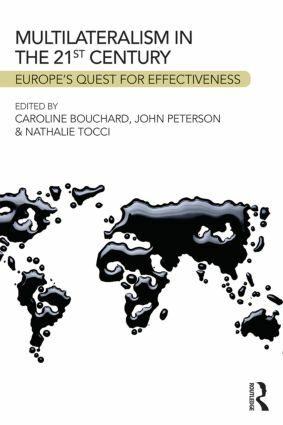 Presenting results generated by MERCURY, an EU research programme into multilateralism, this book addresses a central research question: does the EU deliver on its commitment to effective multilateralism? Globalisation has created powerful new incentives for states to cooperate and has generated renewed interest in multilateralism. While a large body of work exists on multilateralism as a concept, it continues to be ill-defined and poorly understood. This book sheds new light on 21st century multilateralism by exploring conceptual approaches as well as generating innovative, empirical knowledge on its practice. Research on EU external relations has increasingly focused on the concept of ‘effective multilateralism’. Yet, the application of this concept as a guiding principle of EU foreign policy in non-security policy areas has rarely been examined. This book explores whether the EU is pursuing effective multilateralism in specific policy areas, including trade, climate change and conflict resolution, and distinct geographical and institutional settings, both internal to the EU and in specified regions, international organisations (IOs) and bilateral partnerships. This book offers evidence-based, actionable policy lessons from Europe’s experience in promoting multilateralism. The European Union and Multilateralism in the 21st Century will be of interest to students and scholars of international relations, international organizations, and European Union politics and foreign policy. The European Union development strategy in Africa: The economic partnership agreement as a case of ‘aggressive’ multilateralism?